Last edited by the goat on Thu Mar 12, 2015 8:24 am, edited 1 time in total. wow, Nice find. She is a beefy one! Thanks for posting. Wow that thing is cool! I haven't taken pictures, but there is a Munson drop bow sitting at my work shop.. Pretty stoutly built, nice weld quality... Definitely built to a bid spec though. 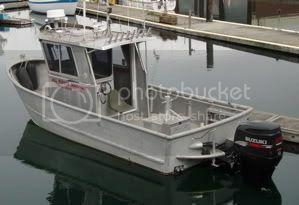 Changed the title to facilitate adding pictures of other boats as I get them. The Munson is definitely "bid spec". After 12 years of running around on CG boats, I was still impressed. Here are some pics of Mavrik Marine's latest creation. After watching the Bristol Bay tv show and looking at some of collateral denting, I can understand why they build thos BB so dam stout. And then they put those tiny fenders all the way around hoping it will help? Boy, that is a shiny one! I saw a great big Munson with the words "research" on the side headed down Highway 305 on Bainbridge the other day. Thanks for the pics. How long and wide does that first one in the pics look like to you guys? She was probably 36-38' long and 11-12' wide. Just an unreal boat. Loosely based on the old Hammerhead design as far as I can tell. Napa Mike wrote: Boy, that is a shiny one! I saw a great big Munson with the words "research" on the side headed down Highway 305 on Bainbridge the other day. Thanks for the pics. Belongs to a friend, Eric Parker, monster Munson. Has a three point anchoring system so he can fix his position right over a dive or sediment sampling location, giant A-frame, load ramp, moon pool, hydraulics everywhere . . .
yep! that is the one.